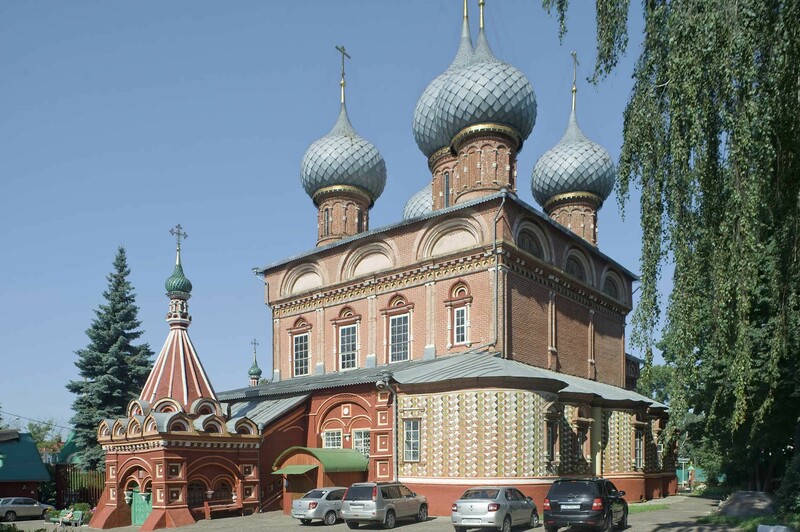 One of Russia’s most colorful churches was built thanks to found treasure. Kostroma. Church of the Resurrection "na Debre". West view. August 12, 2017. 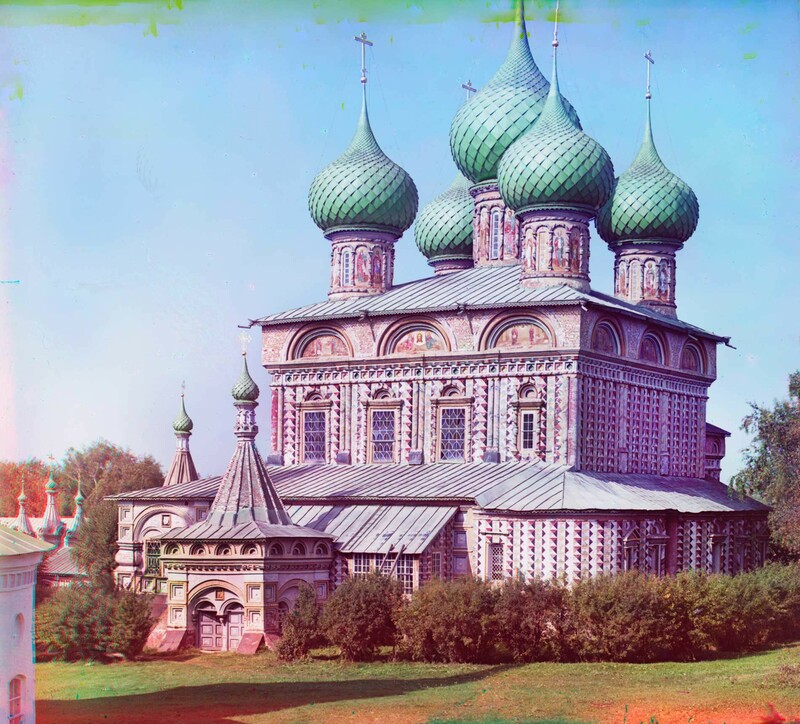 At the beginning of the 20th century the Russian chemist and photographer Sergei Prokudin-Gorsky devised a complex process for vivid, detailed color photography (see box text below). 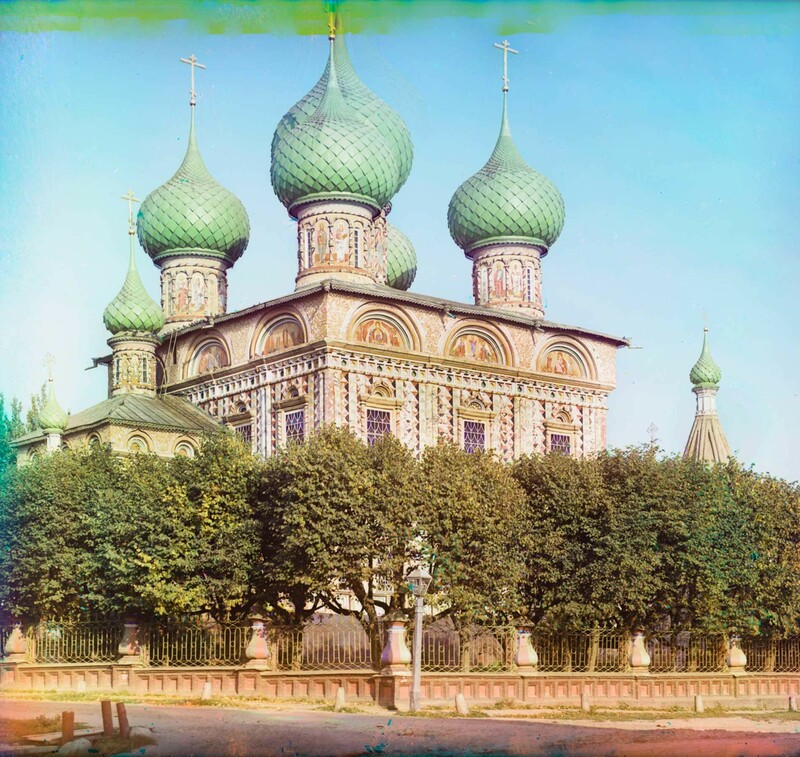 His vision of photography as a form of education and enlightenment was demonstrated with special clarity through his photographs of architectural monuments in the historic sites throughout the Russian heartland. Support for the project came from the Ministry of Transportation, which facilitated his photography along Russia’s rail routes and waterways, including the Volga River. 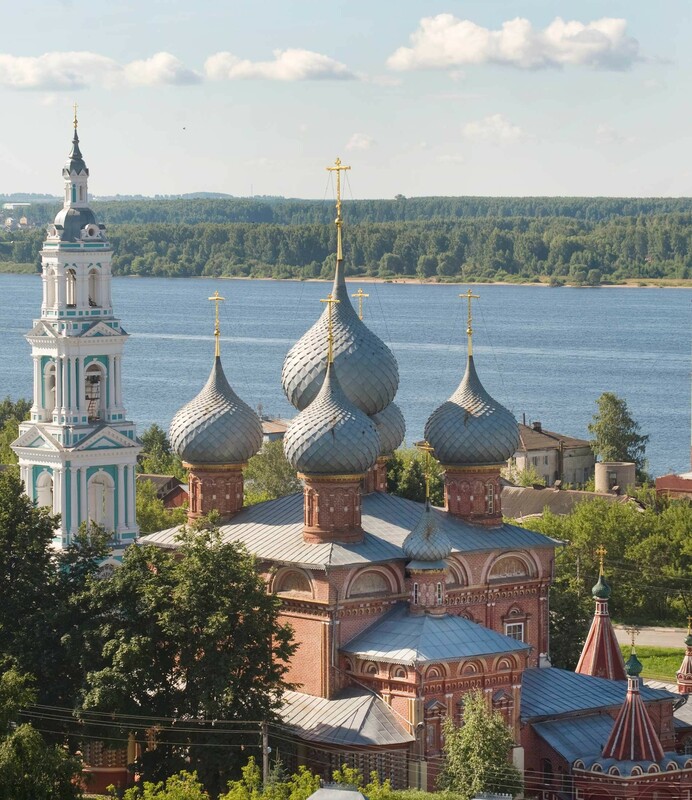 Of the many historic towns along the Volga, Kostroma rivals its neighbor Yaroslavl for the beauty of its churches and for the important role it has played in Russian history. Prokudin-Gorsky made two trips to Kostroma, in 1910 and 1911. My work in Kostroma spans a period from 1988 to 2017. Kostroma. Church of the Resurrection "na Debre". Northwest view with Chapel of the Three Prelates. Summer 1910. 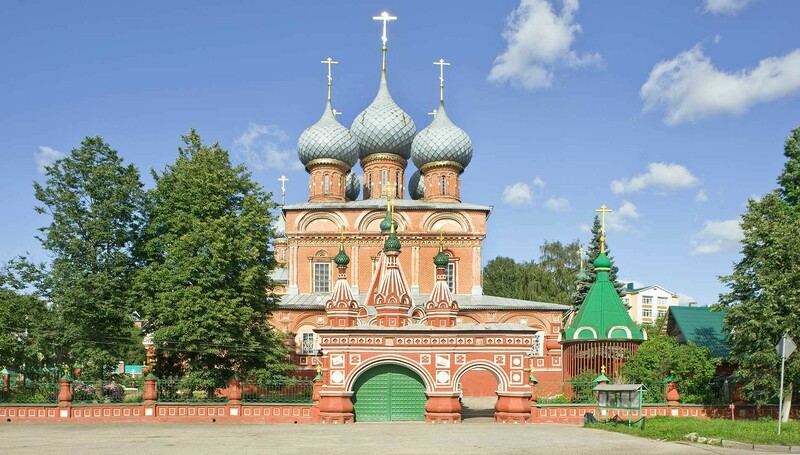 Kostroma’s most colorful church — indeed, one of the most colorful in Russia — is located near the Volga River on the southern fringes of the town’s trading and crafts area (posad, in Russian). Dedicated to the Resurrection, the present church was built in the mid-17th century in a district known for its fine leather work. There were earlier churches on the site, which is called “debrya” from the Russian word signifying a low area thick with trees. Church of the Resurrection "na Debre". Northwest view with Chapel of the Three Prelates. August 12, 2017. Legend has it that the church’s primary donor was one Kirill Isakov, a prosperous leather merchant whose wares were traded as far as England. Once, when opening small barrels of cloth dye from England, he discovered not dye, but gold coins. Suspicious of fate’s largesse (which could perhaps be the work of the devil), the astonished merchant decided — according to popular account — to donate the money for the construction of the church. The church construction was in fact covered by Isakov and other merchant parishioners. The core of the church is a tall cuboid structure located on elevated ground and crowned with five decorated cupolas on high drums. The walls were segmented with paired attached columns that framed tall windows decorated with ornate surrounds. The columns ascended to a cornice containing a strip of coronets. Above the cornice were decorative semicircular gables (zakomary) with frescoes. Polychrome ceramic tiles also graced the walls. Church of the Resurrection "na Debre". Southwest view with gateway. August 12, 2017. 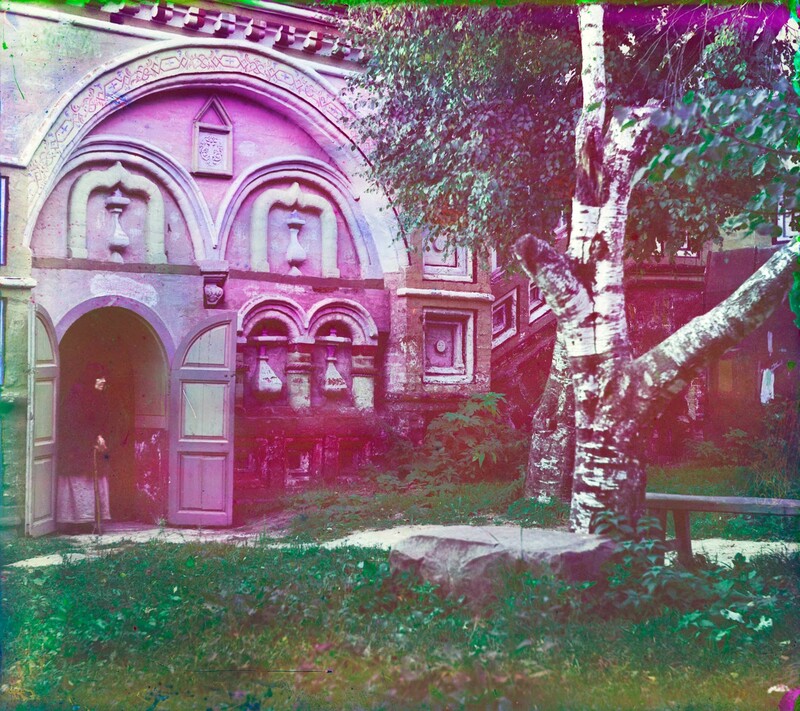 The ornamental saturation of the walls reached its limit with a painted trompe l’oeil diamond pattern clearly visible in Prokudin-Gorsky’s 1911 photograph. This pattern was popular in the late 17th and 18th centuries, as evidenced by the Church of the Hodegetria Icon in the Rostov kremlin. The wall pattern was redone in the 19th century. My photographs from 2017 show the walls repainted in red, with the diamond pattern remaining only on the elaborate apsidal structure, which contains the main altar, at the east side. Church of the Resurrection "na Debre". Gateway. Background: dome of Church of Znamenie Icon. Summer 1910. The structure was enhanced with an elevated gallery extending along the north, west and south facades. Each of the gallery facades is segmented with paired windows set within large arches. The center of each gallery is graced by a stairway descending to an ornately decorated porch on the ground level. Each of the porches has an ornamental roofline with a conical cap supporting a small cupola. This design of porches and stairways leading to an elevated gallery also appeared in large wooden churches during the 17th century. The west gallery, containing the main portal, has the largest porch. Prokudin-Gorsky photographed it in detail, as did I in 2017. 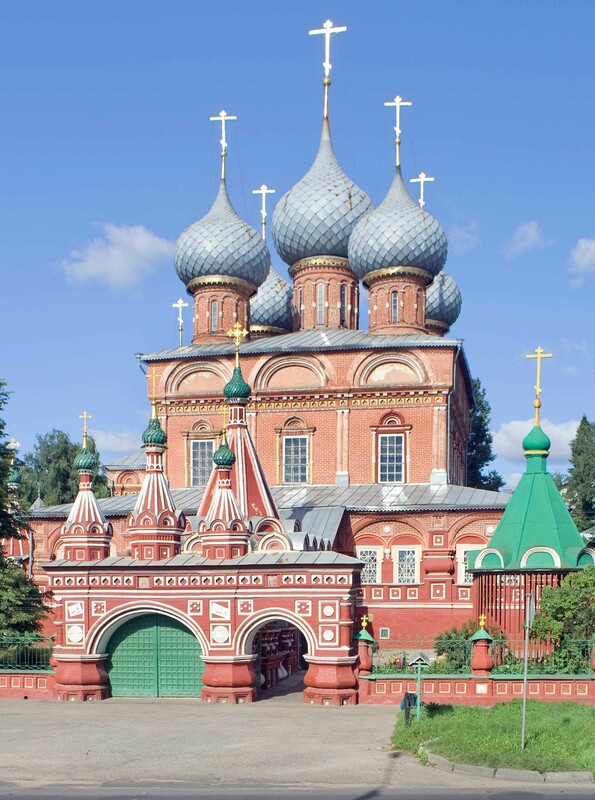 In a final decorative accent, the church territory was enclosed by a fence whose west side, facing the main porch, had a gate structure in two sections, the larger of which was crowned with three ornamental turrets and cupolas. 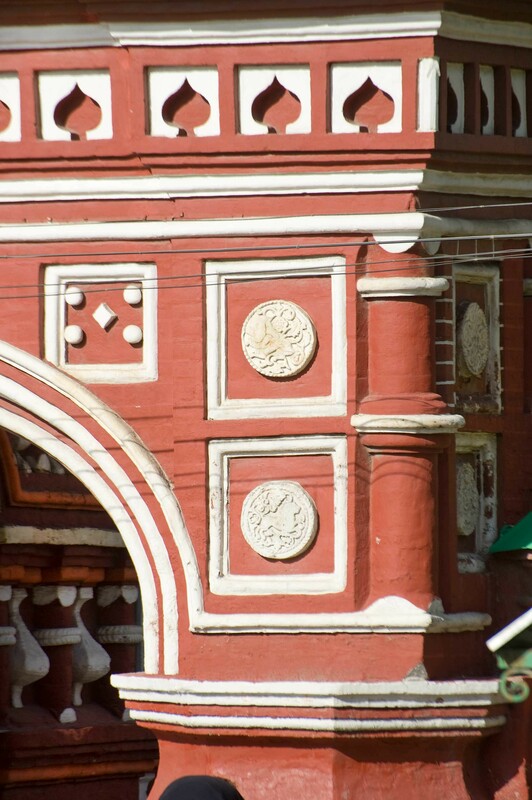 The gateway facade is decorated with coronet strips (like the porch), as well as relief carvings of horses and limestone medallions with carved images including a pelican and a lion, Prokudin-Gorsky’s photograph of the gateway shows a partially whitewashed façade. The limestone carvings are more clearly visible on the red façade of my 2017 photograph. Church of the Resurrection "na Debre". Gateway, southwest corner with carved limestone medallions. August 12, 2017. The interior of the church was painted with frescoes in 1650-52. Overpainted (“refreshed”) in1870, the frescoes of the main space were further damaged during the Soviet period. They were partially cleaned and restored in the 1960s. Unfortunately, there is no evidence that Prokudin-Gorsky photographed on the interior. Church of the Resurrection "na Debre". West porch&stairway, south facade. Summer 1910. Shortly after the completion of the main structure, a large chapel was added to the north façade. Dedicated to the Three Prelates — Sts. Basil the Great, Gregory the Theologian, and John Chrysostom — its frescoes were painted in 1670 and are in relatively good condition. There is another secondary altar, dedicated to St. Catherine, in the south part of the apse. At the turn of the 19th century, a modest “winter” church, smaller in size and more easily heated for services in the colder months, was built just to the south and dedicated to the Icon of the Virgin of the Sign (Znamenie). 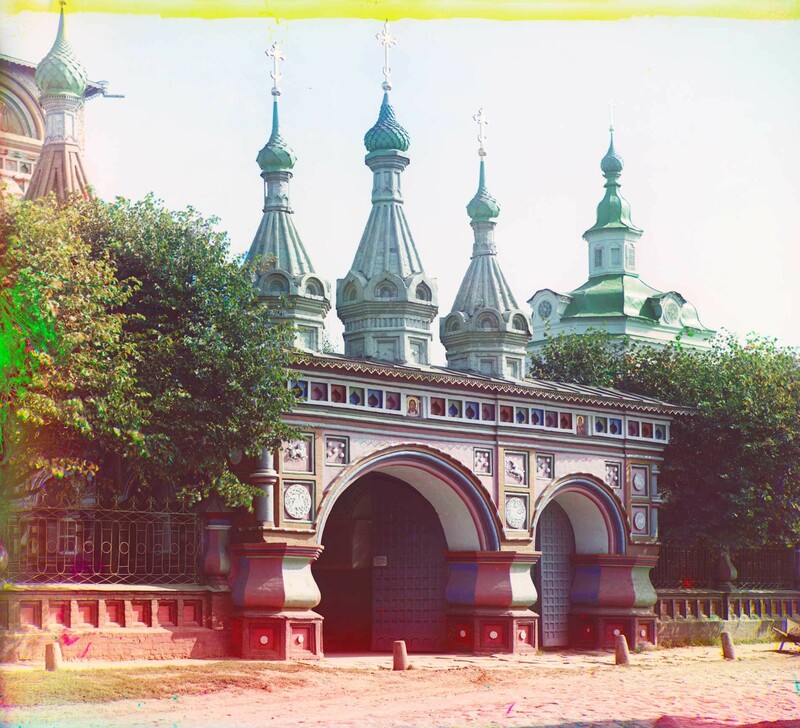 The dome of the Znamenie Church is partially visible in Prokudin-Gorsky’s photograph of the Resurrection Church gateway. Church of the Resurrection "na Debre". West porch&stairway, north facade. August 12, 2017. At the same time the bell tower of the Resurrection Church was dismantled, and a much taller, four-tiered tower was erected at the west end of the adjacent Znamenie Church. The bell tower contained its own altar, dedicated to St. Procopius of Ustyug. The ensemble had reached its final form. In conjunction with the tercentenary of the Romanov dynasty in 1913, Nicholas II visited the Resurrection Church ensemble with his four daughters. During the visit, they climbed the bell tower for a view of the nearby Volga River. Church of the Resurrection "na Debre." Southeast view with apsidal structure. Summer 1910. In the late 1930s the Resurrection Church was closed. 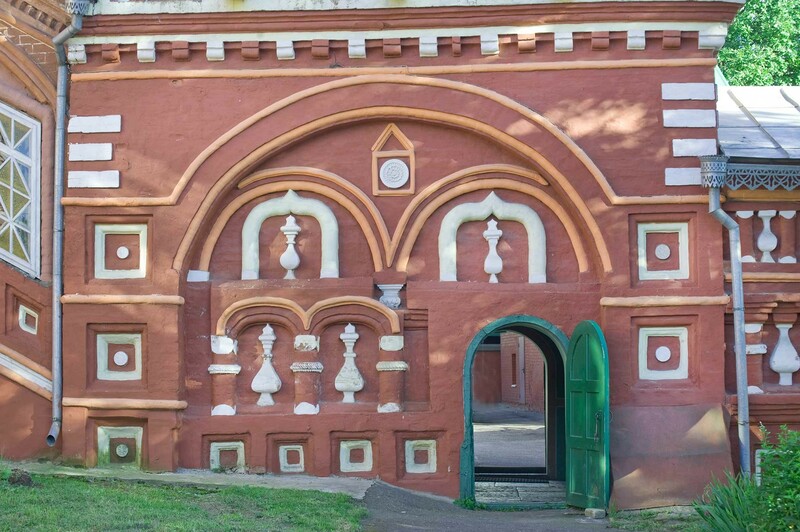 It was used as a granary until 1946, when it was reopened and repaired for service as the primary Kostroma cathedral. During this period the church held the revered Theodore Icon of the Virgin, rescued from the Dormition Cathedral (demolished in 1934), In 1991, the icon was transferred to the restored Epiphany Cathedral at the Epiphany-St. Anastasia Convent, which now serves as the cathedral for the Kostroma Diocese. Church of the Resurrection "na Debre." Southeast view with apsidal structure. August 12, 2017. The Church of the Znamenie Icon was closed in the 1920s, deprived of its dome and also used as a granary. Its great bell tower was demolished in 1937. 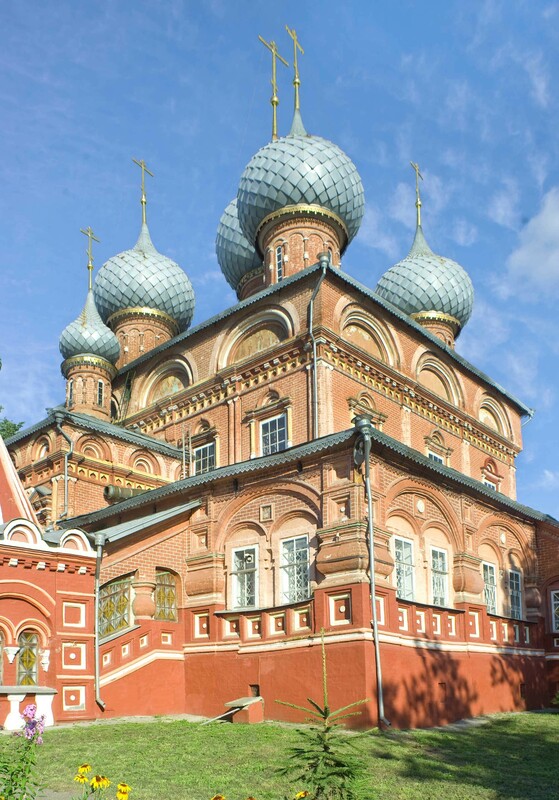 In 1993, the church was returned and partially restored for use as the core of the Znamenskii Convent. Two years later, work began on rebuilding the bell tower. Completed in 2001, the tower has again assumed a place of pride overlooking the Volga. My view from the northeast shows the entire resurrected ensemble with the majestic Volga in the background. Church of the Resurrection "na Debre." Northeast view with Chapel of the Three Prelates. Background: Bell tower&Volga River. August 12, 2017.